Echo’s of erratic gunshots, cattle rustling, dark and wild Nilotic tribes, nomad worriers, poverty, famine and untold violence. This is what most of us have heard about the wilderness of Karamoja, in north-eastern Uganda, a place few dare to venture, but we must remind ourselves to take what people say with a lot of salt, sugar and piri piri. I decided to go and see Karamoja for myself, fortunately, I didn’t experience anything of that sort on my recent trip to Moroto. On the 1st of June, blessed with an extended weekend, (thanks to Ugandan Martyrs day), I, along with four other adventurous ladies, set off on my first venture into Karamoja, 446 km from Kampala. 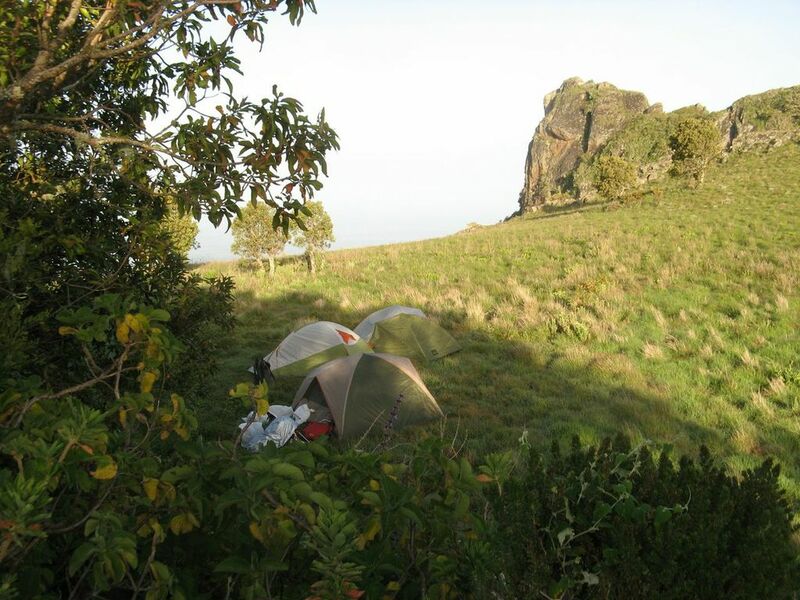 The challenge was to hike up both Mt.Moroto peaks; Sologomon & Sodok and spend 2 nights wilderness camping. I have definitely endured much worse road trips, and was pleasantly surprised with the smooth straight tarmacked highway, up until Mbale town that is. Right past the turn off to Mt.Elgon and Sipi Falls (which you could actually see from the car), the road transformed back into its typical potholed dirt form, that mark most journeys into rural Uganda. We were the only ones on the road for hours, apart from a few NGO or Government cars that would zoom by occasionally. The landscape however kept us distracted throughout the rest of the bumpy ride. So used to the sight of endless rolling hills on the drive through South West Uganda, the long drawn out plains of the North East were a refreshingly new sight. I have never driven through so much flat land before; the road seemed to stretch out into the horizon, and beyond *1. Along the edge of these sprawling fields of maize/corn, sorghum and savannah, majestic mountain ridges, edgy and geometric at some points, rimmed the landscape. The most striking range I thought was the Kadam Mountain range, which another MCU group was set to climb during the same weekend. 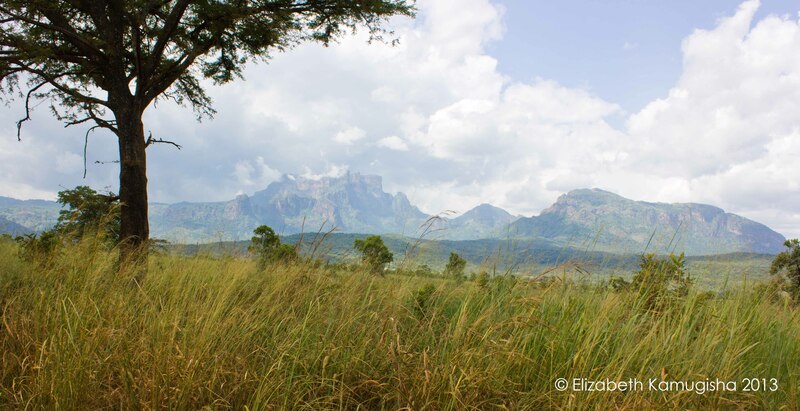 The amazing view of the Kadam range…is it me or does it look like the side view of an old woman laying on her back?! A roadtrip is never complete without getting a little lost along the way. 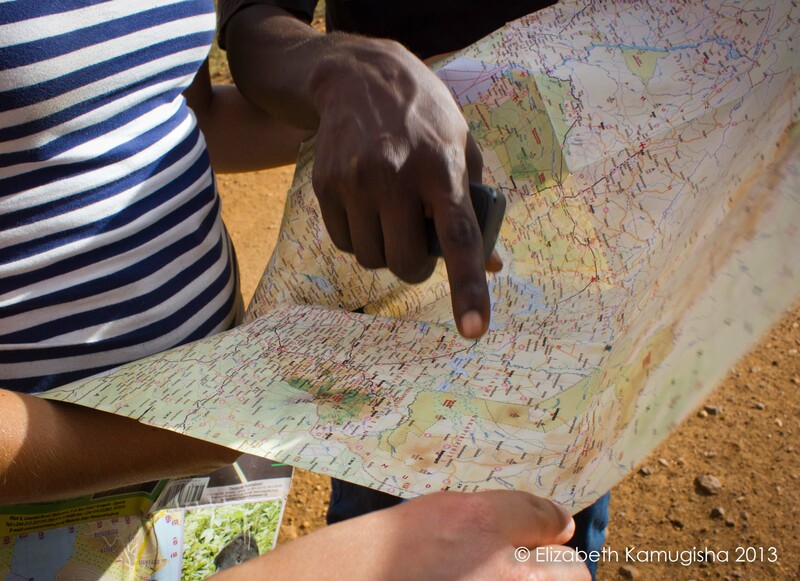 We navigated our way back the old fashioned way; maps! 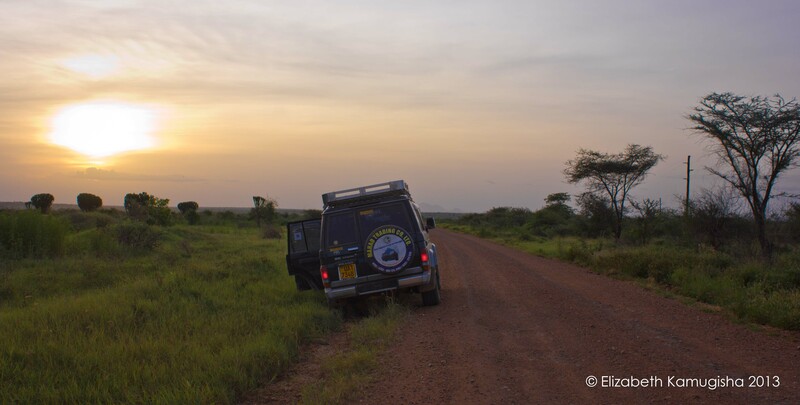 We arrived in Moroto town just after dusk, and found our way to the homely house we would be crashing at for the night. Our host, who was also the navigator and leader for the hike turned out to be one of my high school friends Dad! It really is a small word after all. 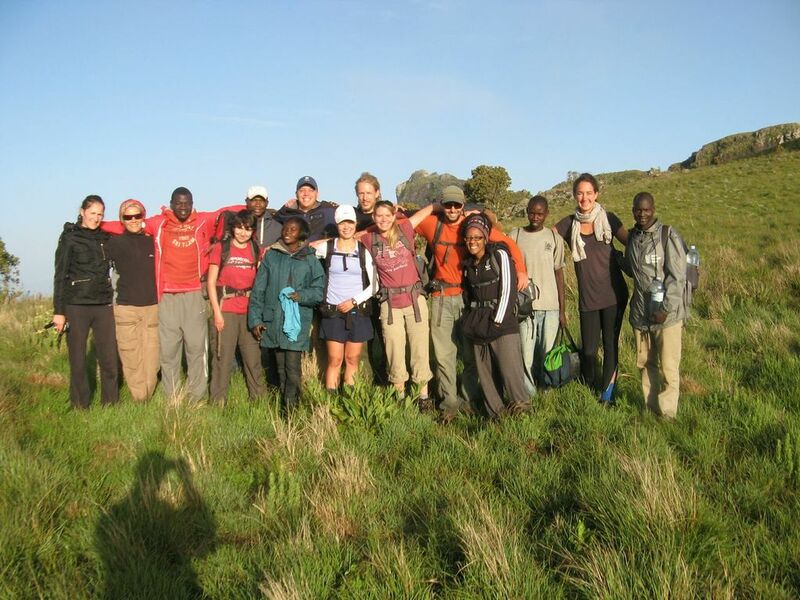 Early next morning we met the second half of the group, which was mostly made up of the expatriate community working in Moroto. We were 15 in total, and from all over the world too. 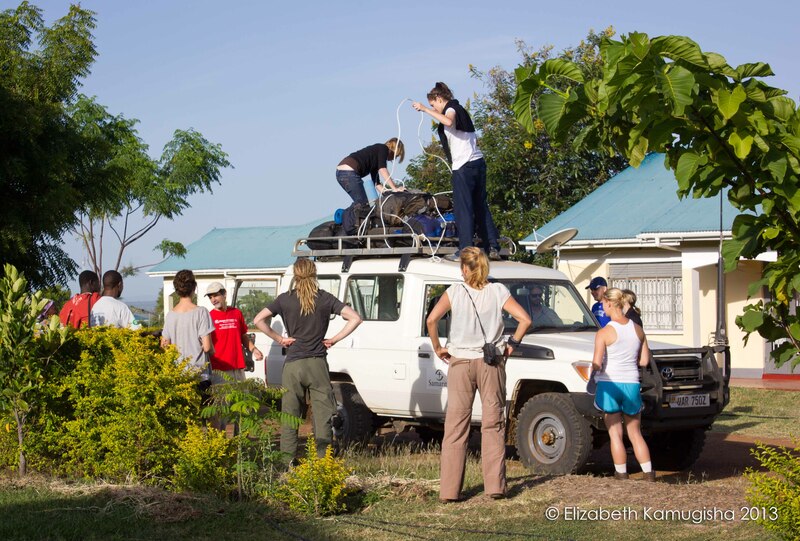 After reshuffling the shared equipment, like the tents, stoves and food, we strapped the bags on the roof of our 4×4 and drove to the starting point of our hike, a beautiful Bougainvillea covered Parish, in Tapac at the foot of Mt.Moroto. And the conquest begins! Strapping our backpacks on the roof before we make our way to Tapac, our starting point. The drive to Tupac is probably the reason people insist that you must take a 4×4 car. Despite being a 40km it took us about an hour and a half to get there, and involved driving through the type of roads that make cars in those old cartoons, pull up their fenders like skirts and cautiously tiptoe through on their rear tire’s! We rounded up a few porters from Tapac, and one of the group members who was fluent in Karamojong, came to an agreement with them that they would help carry our boxes of water, (which was the bulk of our weight since we each needed at least 4 liters a day, and that added up to about 60kg) to the area we would be camping for the night and return back to the town before dark. They set off ahead of us, but soon gave up, demanding to increase their pay. Turns out one of them had stirred up he rest, convincing them to eventually just abandon the boxes of water half way, before we could agree on an increased sum of payment. 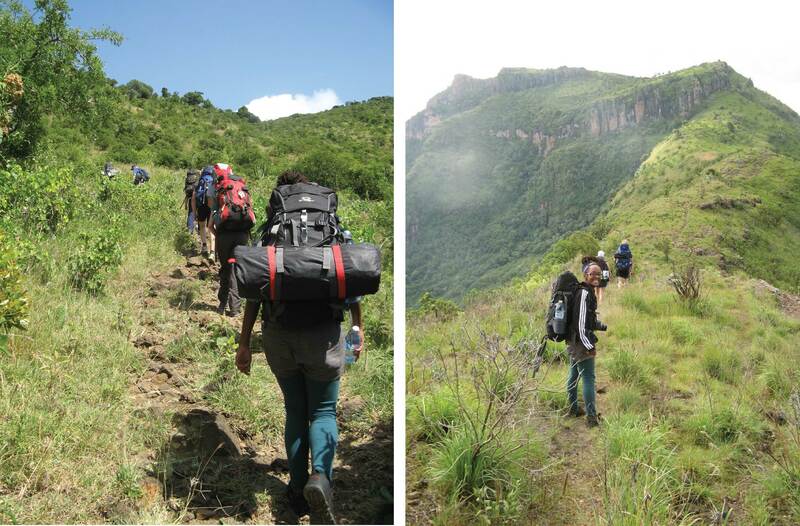 The problem with hiring porters on your climb up Moroto is that there are no facilities on the mountain, so you end up being responsible for their shelter, food and safety, which would mean bringing along extra equipment or sharing yours since the weather on top is quite harsh. A previous MCU group experienced this challenge on their last climb, and recommends not taking porters at all unless you are prepared to fully facilitate them. If you only need some equipment to be carried up and dropped off, like we did, I recommend hiring female porters. The Karamojong women seem to be more reliable and hardworking than the men. We eventually had to split up the water, and each add between 3kg – 8kg onto our own backpack weight. Needles to say, it was the most challenge climb I’ve ever done. Not only was it my first time to hike with all my equipment, but I was carrying an ambitious 7kg/8kg (approx) that seemed to get heavier with every step. 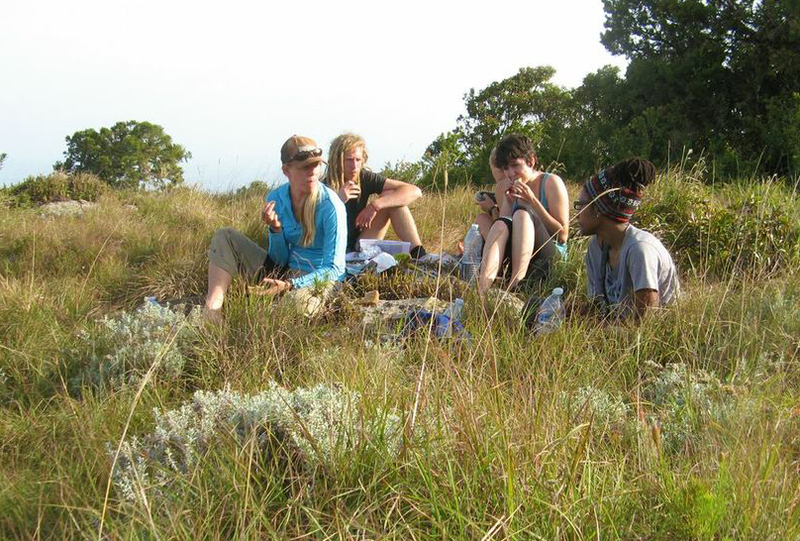 (I eventually settled at a fair 5/6kg, which I was more able to carry without cursing with every step) Despite being at the back of the group for most of the hike up, the group was encouraging, and took lots of short breaks and cheered as I caught up. I have to say this was the best group I’ve hiked with, no one complained about anything, and everyone kept up a contagious enthusiasm through out the whole trip. Once you start a hike like this, there is no turning back, unless its for a photo of ‘course! 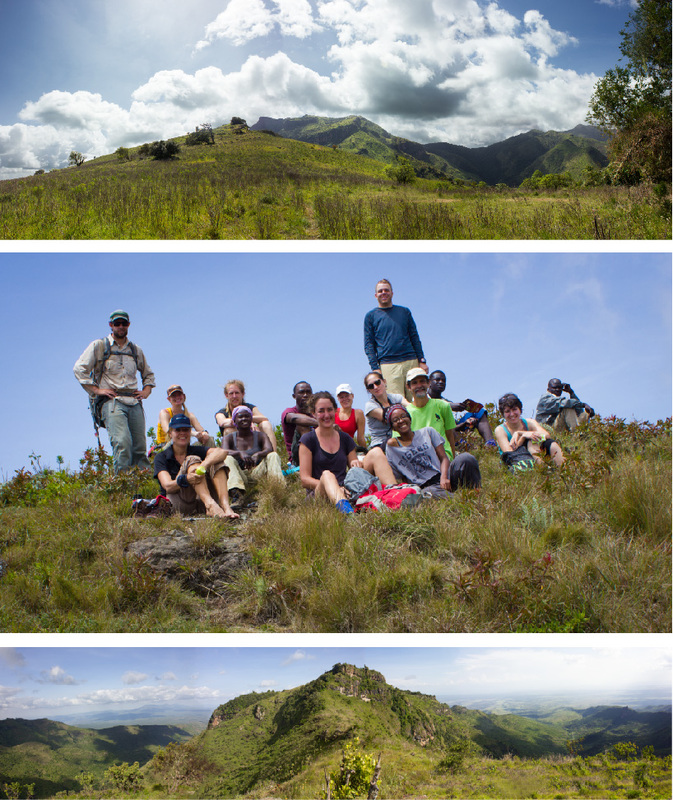 Despite the dragging weight of the backpack, I really enjoyed the Mt.Moroto hike. There’s something about enduring physical challenge that purifies you. 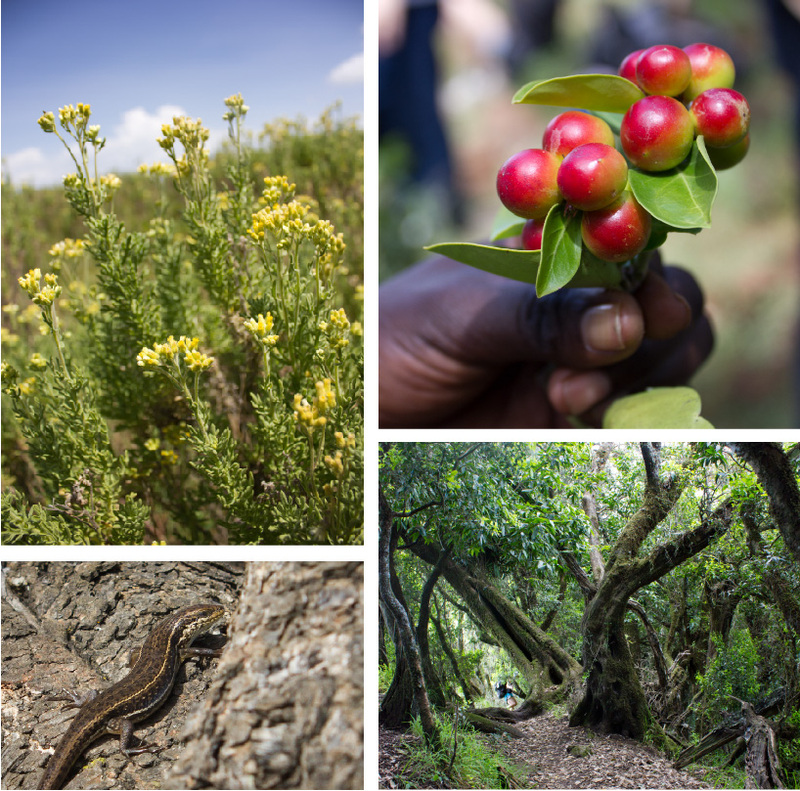 Although some people advise against taking many short breaks, I think it’s necessary, as it gives you a chance to look up from the trail and take in the glorious, Afro-Alpine vegetation and landscape. Stop and smell the flowers, wildflowers that is! It is on these breaks that I noticed the rousing smell of wild peppermint in fields of wildflowers, the rumbling swoosh of the wind through the treetops, and the shape shifting shadows of fluffy cumulus clouds traversing across the valley plains bellow. It is on these breaks that I renewed my motivation to keep going. Reaching the first peak of our twin peak challenge, ah the satisfaction! Yoga on the mountain peak; after hauling a heavy backpack all day, ‘shen the wheel’ has never felt so good! We reached the first peak, Sogolomon (3027m), just before the sunset. We decided to camp just below the peak, out of the way of the icy mountain winds. After setting up the tents and changing out of our sweaty damp clothes, a few of us stated preparing dinner, on a small camp gas stove. We eagerly shoveled a warm mushy mixture of rice with baked beans; ‘mountain risotto’. Thanks to the foresight of one ingenious Englishman, we enjoyed a cup of warm tea too thanks to an old fashioned metallic kettle, (complete with a handle and spout) that he brought along! The best part of that night, undoubtedly, was the night sky. Sparkling lights, suspended, seemingly at different distances so some appeared bigger and brighter and others smaller and farther away, against an extravagant darkness, with glittery swirls of the milky way. The stargazers amongst the group pointed out the recognizable Big (and Little) Dipper, and Southern Cross constellations, as well as the more obscure ones, which required you to peer a little harder. We saw about 5 shooting stars, the most I’ve ever seen in one night. 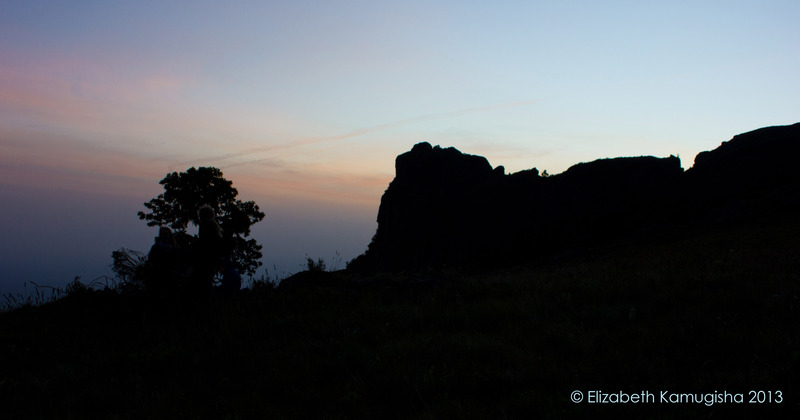 Next time I climb Mt.Moroto, I will bring a tripod and try to capture a slice of the heavens. I was relieved the next day to leave my backpack back at camp for the hike up the 2nd hike up the highest peak, Sodok (3080m). The trail offered different landscapes from yesterday and had parts where we had to do some solo rock climbing, balance on narrow pathways along cliffs and walk through a lush canopied forest, and along wide ridges with amazing parallel views. New day, new challenges, putting our balance and climbing to the test. We all made it, and were rewarded with an amazing 360 infinite view! In the evening we all collected some firewood and built a huge fire. Conversations are always better around an outdoor, pine scented, smokey crackling fire! Gathered close around the fire, we animatedly talked about all sorts of things, from the controversial topic of disarmament to the local legends and folklore of the Karamajong. 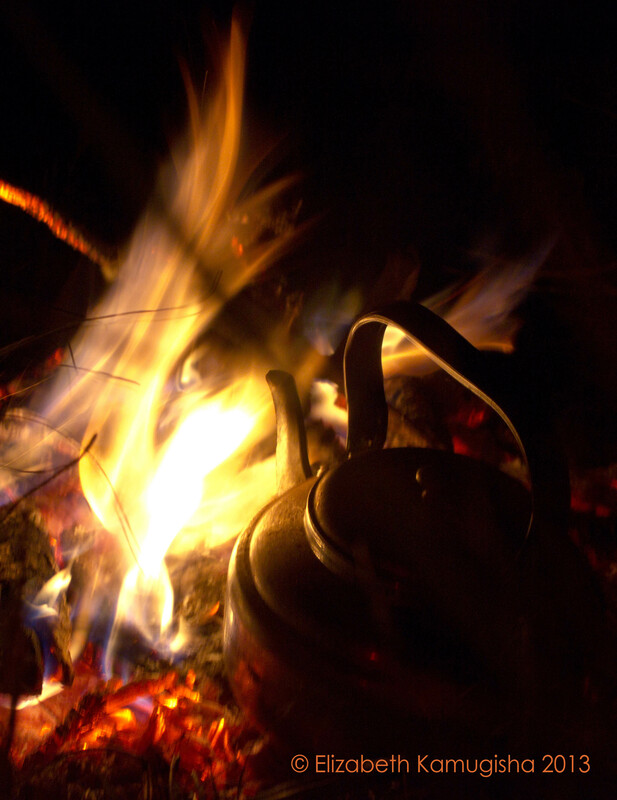 Cold tea on a hot night, you really appreciate the simple comforts of civilization when camping in the wilderness! We went to bed a little warmer than yesterday. In the morning, the ladies I had driven up with, plus a new friend who needed a ride to Mbale, pulled down our tents, said our goodbyes, and set off earlier and made our way back the way we came to Tapac, rather than hike to Moroto town (the original plan) which would take longer, in attempt to shorten our long journey back to Kampala. The ‘Kampala Girls’! Thank you ladies for the good company! Sweaty with all windows rolled down, exhausted but satisfied with the sense of accomplishment; we started our journey back. We stopped in Mbale for dinner and treated ourselves to a delicious meal at a popular Indian restaurant, (something that’s becoming a bit of a MCU trip tradition). Reaching Kampala past midnight, we were each dropped off at our gates. After attempting to scrub off the first few layers or dirt, sweat and sunscreen in the shower, I crawled into bed. Despite dreading the prospect of showing up at the office in the fast approaching morning, I drifted off to sleep with a wide, satisfied smile on my face. 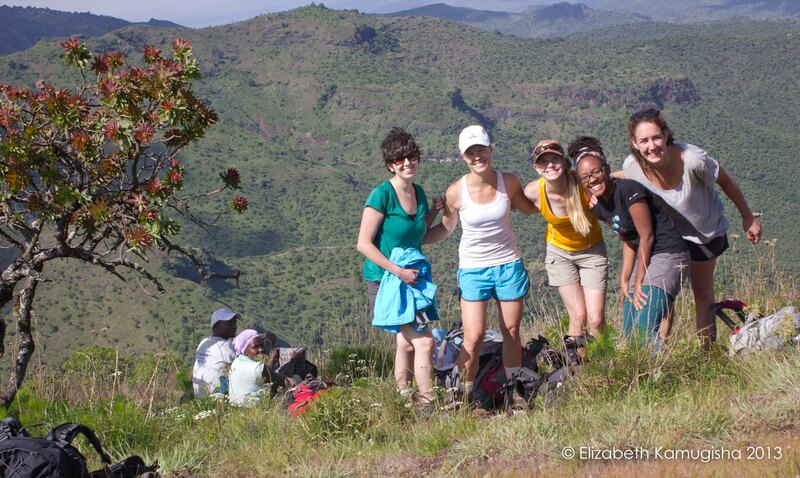 Mt.Moroto if officially checked off my ‘Must Climb’ list of Uganda, Hurrah ! *1 – Bring along some epic road trip music, something immersive and transcendent for you’re soundtrack through this beautiful landscape. My road trip soundtrack was Trespassers William, Natural Order of things. P.S. Special thanks to Alastair Taylor and Pearce Godwin for contributing to the archive of photo’s! It’s always nice when some one else brings along a camera too, because you get a chance to be in some of the photo’s! This is my kind of adventure. 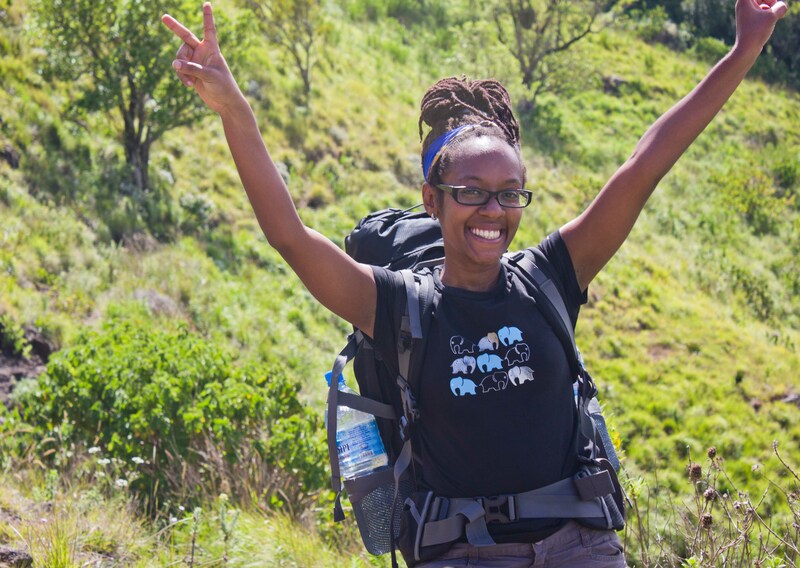 I would have fought an elephant to join you guys especially KARAMOJA of all destinations. indeed the story the world knows of Karamoja is exaggerated. I have been to that region a twice but always fell in love more each time. If only days are could be rewound, this is the kind of trip i would invest all my heart on. Thanks for THE VIRTUAL tour. You know it’s a good story-story when you have to stretch after reading it. I truly enjoyed this account of your hike, Liz. I have never been on an adventure like this one. I should make it a goal to go hiking before my next birthday. Some things in your story made me sad though, like the advice you gave about hiring female porters because they are more hardworking than the men. I do hope you also meant that you’d pay them more (and give fat tips) to reward them for doing such a good job. Also, question, what do the Karamojong in their version of civilization (not wilderness, never wilderness) take/ do to warm themselves on cold nights? Did they share their secrets? From what i was told about the daily lives of the Karamajong, and saw in the short time i was there, the Karamajong women seemed to do all the hard work. They are the ones in the fields cultivating land, planting and harvesting, on the street carrying jerricans of water from boreholes and skillfully balancing all sorts of things upon their heads for long distances…when i did see the men, most of them were seated in groups under some shade on the sides of buildings or under trees seemingly chilling. (the few herdsmen we saw at the beginning of the hike were more boys than men). It seemed to me perhaps women in that region are more used to handwork and hence generally would have better work ethic…agreeing to the job and fees and then giving up half way without much of a negotiation was not cool of those guys. We were willing to pay more, and with big tips too, because the truth is we need them more than they need us. Well most move around with warm Shuka’s wrapped around them. Still, i doubt that is nearly warm enough ontop of the mountain…Generally most don’t go up that high to sleep in the wild mountain, thats for crazy tourist types, i think they just go home and cuddle up in their Manyatta’s around a fire with their families and beloved cattle. Fire really does help though…Oh and one of our guides did carry along a quarter bottle of gin which was shared round. Wow! I have been to Karamoja several times (for work) but every time my love for the Karamajong grows. But this is one exhilarating adventure that takes you to the heart of the finest magical. I must come along with you on your next trip.